The Philippines' leading carrier, Cebu Pacific (PSE: CEB), celebrates the anniversary of its operations to Doha, Qatar, with an exclusive, week-long seat sale. Photo by Manuel Nierra II - PPSG/AUP. June 5, 2014, Davao International Airport. CEB is the only low-cost carrier operating direct services between the Philippines and Qatar, with a total of three flights per week starting July 9, 2016. The airline is offering the seat sale for these thrice weekly services, or for travel between July 9 and September 30, 2016. Passengers who wish to explore Doha's rich culture and architectural wonders may now book one-way flights for as low as P3,999. Quoted fare includes country-specific taxes and fees. Baggage, hot meals, seats with extra legroom, and onboard Wi-Fi, among others, are options that may be added per the passenger's preference. This exclusive promo is available from June 4 to June 10, 2016, or until seats last. "We take pride in servicing the growing Filipino community based in Qatar. By bringing the Philippines closer to the Middle East and launching such exclusive seat sales, we are optimistic that we are offering people more opportunities to fly and create beautiful memories with their loved ones," says Atty. JR Mantaring CEB Vice President for Corporate Affairs. CEB's passenger volume to and from Qatar remains robust, with over 58,000 travelers flown since the airline began operations on June 4, 2015. Latest statistics from the Philippine Department of Tourism also indicate that visitor arrivals from Qatar to the Philippines rose by 10.4% between January to March this year, versus the same period in 2015. Qatar houses the third largest Filipino community in the Middle East. To meet increasing travel demand, CEB recently announced that it will mount an additional flight between Manila and Doha beginning July 9, 2016, increasing services to three times a week. Aside from Doha, CEB also serves the other markets for global Filipinos in the Middle East: United Arab Emirates via Dubai, the Kingdom of Saudi Arabia via Riyadh, and Kuwait. The airline's extensive network covers over 90 routes and 64 destinations, spanning Asia, Australia, the Middle East, and USA. 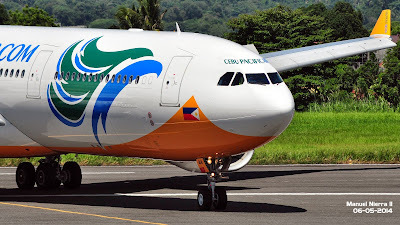 Its 57-strong fleet is comprised of 7 Airbus A319, 36 Airbus A320, 6 Airbus A330, and 8 ATR 72-500 aircraft. Between 2016 and 2021, CEB expects delivery of two more brand-new Airbus A320, 30 Airbus A321neo, and 16 ATR 72-600 aircraft.